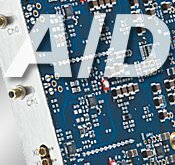 The A/D product can either come in the form of a plug-in card, as a remote/Ethernet instrument or as a complete system containing the A/D acquisition part, an integrated PC and the operating software SBench 6. Most of Spectrum digitizers and A/D cards allow to be used as a mixed mode DAQ (data acquisition) device by combining analog and digital channels in one system. The combination can either be done by adding digital input options into the card making a single card mixed mode DAQ out of it or by combining tow or more cards using the internal Star-Hub. Combining digitizers with digital waveform acquisition cards can generate a mixed mode DAQ system with a wiede variety of channel combinations.